It’s 1pm, my brother and I are standing at Plaza Moyua waiting to get on the A3518 to Bakio, the nearest town to San Juan de Gaztelugatxe. I am scrolling the countless screenshots on my phone about the destination, Google Maps and how to get there. It's about 20°C and we've got another 20 minutes until the bus arrives, at least I think. I'm aimlessly walking up and down when a local señora approaches me and exclaims 'Donde vas?' (Where are you going?). I quickly responded 'Bakio' and I felt instant relief when she said 'Yo también' (Me too). For the next hour and a half, not only I practiced my Spanish with this well-dressed old lady, but my brother and I were astounded on the generosity of this woman named Begoña. 'Soy muy famosa en Bilbao, soy la única con este nombre. Estas mirando a la patrona Begoña' (I am very famous in Bilbao, I am the only one with this name. You are looking at Begoña the patroness) she revealed. Now I know from Narcos that el patrón refers to the boss. I want to assume that this is what she meant. Needless to say the name is unique, and a simple research will direct to you the story of the 'patrona de Vizcaya'. Just before we were allowed to enter the bus, I curiously asked how much were the tickets, in order to prepare my coins. The look on her face suddenly changed and asked me 'No tienes dinero? No se porque tengo la tarjeta barik' (You don't have any money? I don't know because I have the Barik transport card). With no hesitation I replied 'No, yo tengo' and I smiled. From the corner of my eye though, I could see her opening her little purse and took out a €5 note to pay for our tickets. I refused a hundred times to accept it, however she insisted and proceeded to pay. She said we reminded her of her grandchildren who are in Germany. I must have thanked her a million times and told her she didn't have to do it. Half an hour later and endless talks about our destination, she opens her wallet again and takes my hand and puts a €20 note this time. Refusing again to accept the money, I repeatedly asked 'Por qué'?' however her response was funny and simple: 'Cállate por favor' (Shut up please). After that, the only thing I said besides 'gracias' was 'Beberemos en su salud' (we'll drink to your health). 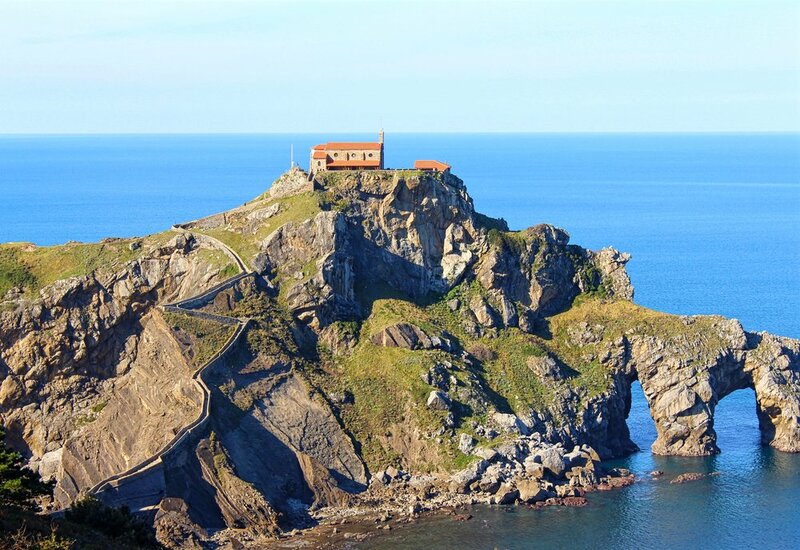 Our ride to Bakio was 50 minutes long and we got to hear stories of the famous San Juan de Gaztelugatxe. How this small islet that is extended to the sea is a hot destination for the summer. Or how organised the municipalities, sharing 'custody' of this enchanting place are and how often the buses run that take you up there. (Every 15 minutes in the summer as opposed to every 2 hours during winter). Our 'local guide' Begoña told us that there is only one road leading to the church and it is not made for pedestrians. She suggested we go 'poco a poco' (little by little). On our way to Bakio we passed through Mungia 'un pueblo más importante' (an important village) according to Begoña. The reason? I don't know she spoke very fast so I didn't understand. We finally wished each other the best and hugged goodbye our new local friend and embarked on the adventure that is to reach the craggy fort. We were immediately welcomed by a warm summer breeze that escaped from the sea. We saw surfers heading to the beach and even though we are pure islanders surrounded by the sea, this view was something unique to our eyes. I must admit, I did not anticipate the level of difficulty of our hiking yet my luck struck once again. Not even mid-way through we are standing in front of a bus stop pole waiting miraculously of a bus to show. 'Let's wait another ten minutes and start walking again ok?' I said to my brother. As I was saying it, I see it in the distance; a local taxi is approaching us. Waving in happiness the mini bus taxi, with six Spanish tourists heading to Bermeo, took us on board to the nearest stopping point for only €1.30. The jaw-dropping coast of Bakio where surfers gather throughout the year to fight against the waves. 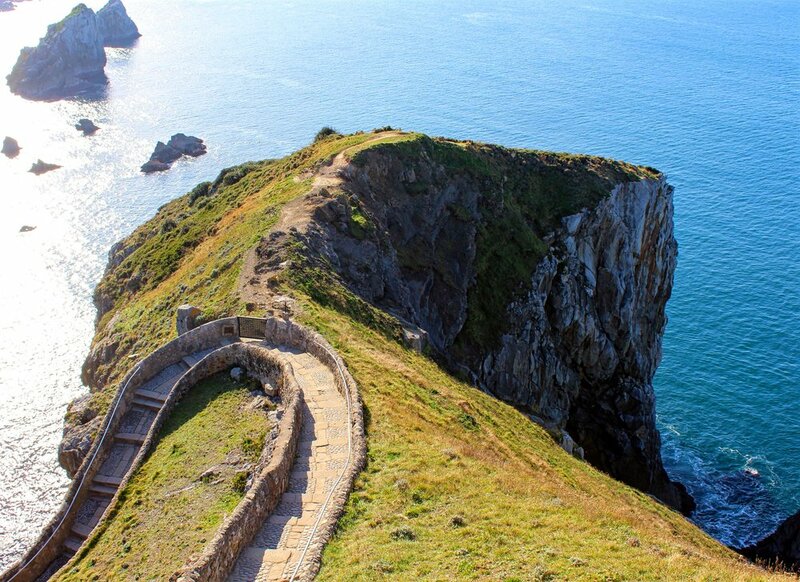 Some blogs will say 231 steps to get to the top point, other sites will say up to 240. Now I haven't counted them all myself but let me assure you they most certainly have not counted the steps from the mountain top to the sea level. It's tough but worth it! 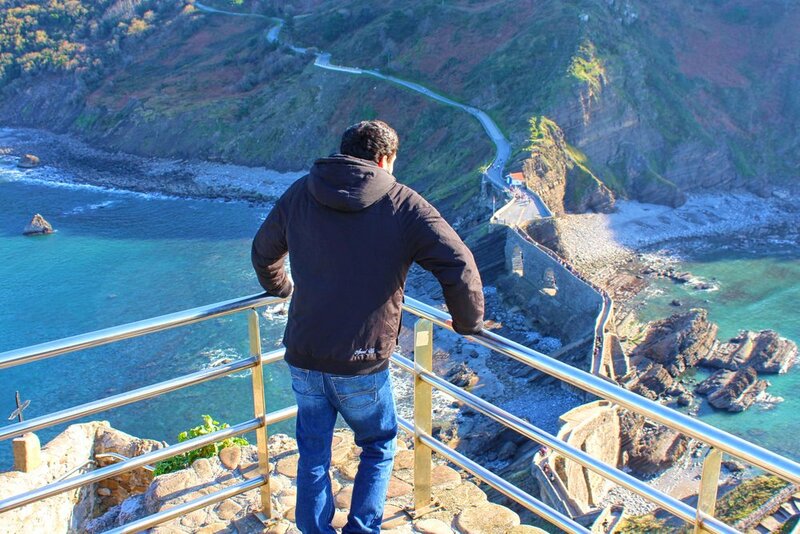 Fun Fact: This November, this scenic spot hosted the filmmakers of Game of Thrones. Miss Diary Wings a Cypriot traveller and adventurer with itchy feet just like me, has visited the little church that is dedicated to San Juan (John the Baptist), whilst filming of the new season took place. 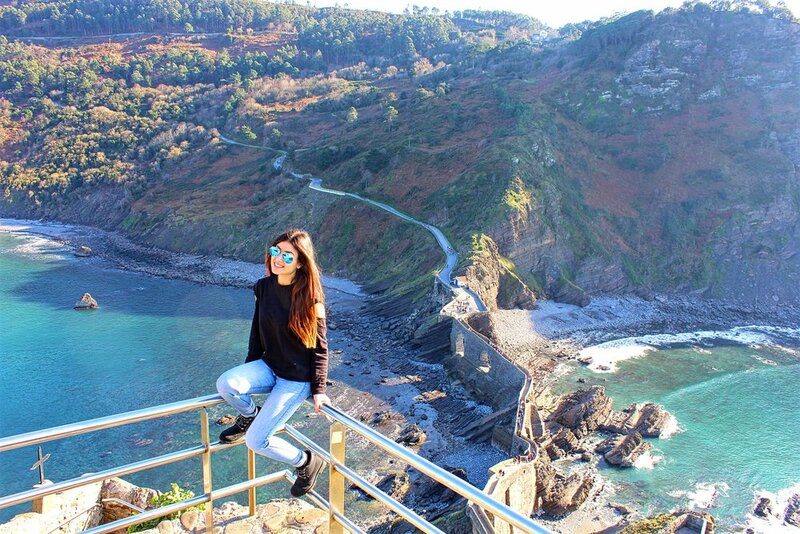 After, reading, learning and researching more about this charming spot on the North of Spain, it became my mission to visit it. And unexpectedly enough, a month later I was booking my flights to Bilbao. Thank you APOEL (the Cypriot team I support played against Athletic Bilbao for the Europa League). 35km from Bilbao later, we reached our destination. Legend says that after completing the climb you should ring the bell three times and make a wish. And of course that's what I did. Words simply cannot describe my feelings when I discover new places, meet people and walk many kilometres to get to an unknown destination. Rather, I will let the images speak for themselves. I spent the most romantic day of the year (Valentine's day) hiking and climbing to reach this stunning location. Oh so worth it! 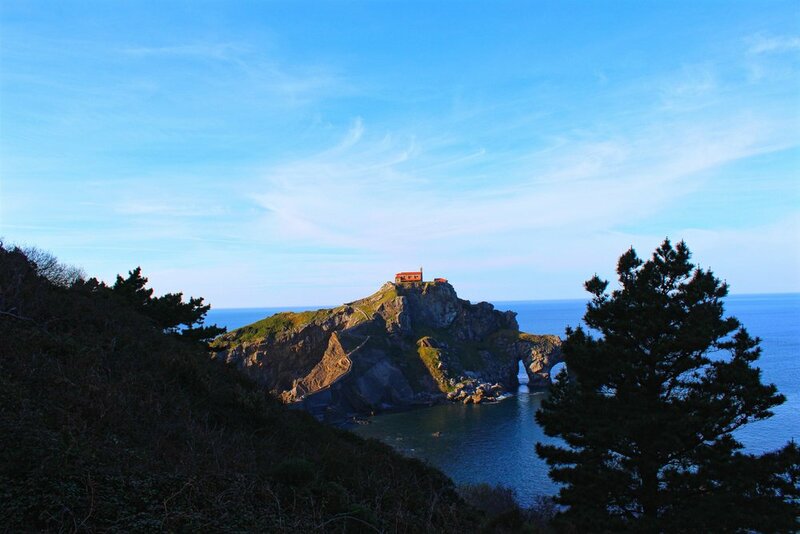 San Juan de Gaztelugatxe it was a pleasure and I look forward to seeing you behind the screens for my favourite show. Next up, I am off to another Game of Thrones destination with a team of 11 passionate travellers from Cyprus!